In a small light colored pan on medium heat, melt the butter stirring occasionally. Cook the butter until it begins to have a nutty smell and turns an amber color. Do not overcook as it will burn easily. Remove the browned butter to a glass bowl or cup. Stir in the 2 tablespoons peanut butter and set aside to cool. Cut a length of parchment paper to fit a 8x8 baking dish allowing the paper to come up to the top of the pan on both sides. Cut another sheet to fit in the opposite direction also trimming at the top of the pan. Spray the parchment paper lightly with cooking spray. Set aside. Whisk ¾ cup flour, baking powder and salt together in a small mixing bowl. Set aside. In another medium mixing bowl combine the browned butter and brown sugar until blended. Add the egg and vanilla and mix well. Fold the dry ingredients into the butter mixture just until combined. Do not over-mix. Add the remaining 1 tablespoon of flour to the peanut butter chips and toss until the chips are somewhat covered. Add the peanut butter chips (with flour) and the peanuts to the batter. Fold in gently. Spread the batter evenly in the prepared pan. Sprinkle a few more peanut butter chips on top if desired. Bake until the top is shiny, cracked and light golden brown, 22-24 minutes. Do not over-bake. 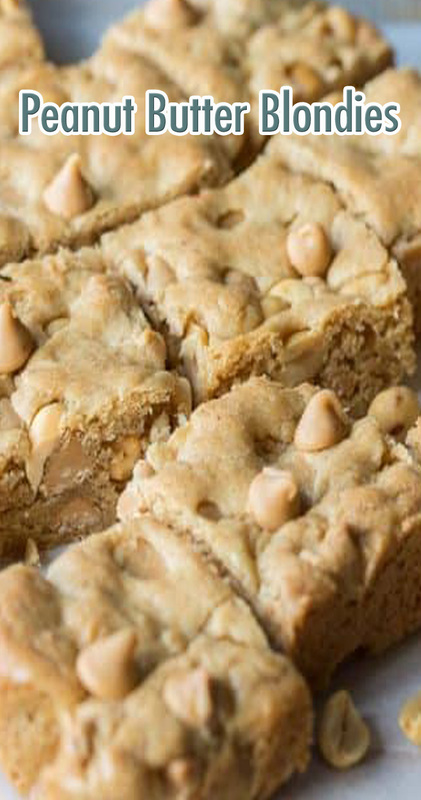 Blondies should be chewy, not crunchy. Cool the Blondies in the pan then lift out using the parchment paper. Transfer to a cutting board and slice into bite sized squares. Enjoy!